SO3188 4313. On Arthur’s Stone Lane near the B4348 road about 1 mile north of Dorstone, overlooking the Golden Valley, stands the prehistoric monument known as Arthur’s Stone, a multi-chambered Neolithic burial tomb dating from 3,700-2,700 BC. The chamber stands upon a nearly circular low mound or bank 26 metres long orientated north to south, that is cut off by the country lane at the eastern side. 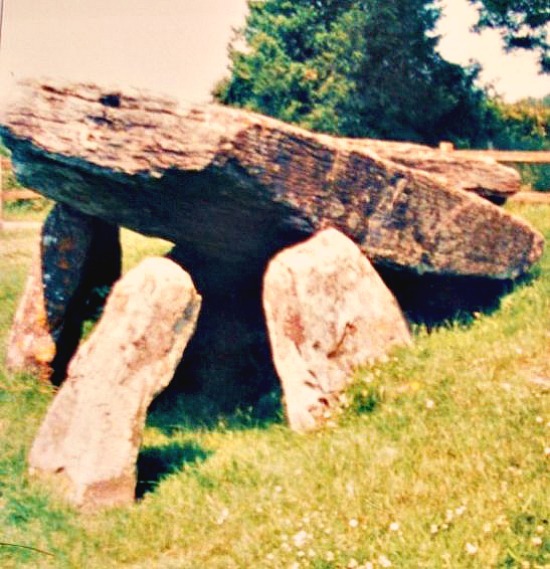 The large capstone, now broken in two, is supported by nine upright stones or orthostats – the capstone is thought to weigh 25 tonnes. The entrance passage-way at the north-west side is 4.6 metres long and inside there is the usual forecourt which consists of a series of stone slabs at intervals and an ante-chamber. There is a false entrance stone at the front side nearest the lane. Originally a mound of earth 3 metres high would have covered the whole chamber but this has eroded away over time. To the south of the chamber there is the Quoit Stone complete with cup-marks and another stone, perhaps a peristalith – the cup-marks on the quoit stone were made, according to local legend, by King Arthur’s elbows. Other legends tell of Arthur killing a giant here or the famous king himself being buried in the chamber, and even Arthur fighting in a battle close by. Otherwise King Arthur has no real associations with the monument because it pre-dates him by many thousands of years. But almost certainly Arthur, if he did exist, would have seen the burial chamber and recognised its purpose – a burial tomb that was built for a person of greatness and reverance in more ancient times. 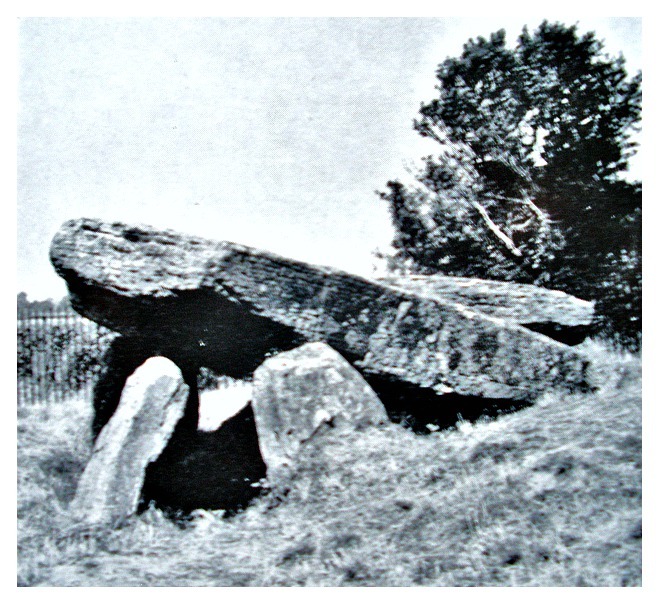 Categories: Arthur's Stone, Burial Chambers, Herefordshire. | Tags: Arthur's Stone at Dorstone in Herefordshire | Permalink.